Check off another goal in what has been another great soccer season. The Newport Central Catholic Lady Breds won the All “A” Classic State championship on Sunday with a 2-0 win over the Owensboro Catholic Lady Aces in Elizabethtown. This marked the first crown since winning the tournament three consecutive years from 2005 to 2007. The Lady Breds recorded two sound victories on Saturday to make it to the title game. They beat Pikeville, 10-0 before knocking off Bardstown Bethlehem in the semifinals, 5-2. NewCath moved to 11-1-2 with the win. The lone loss for the Lady Breds came 1-0 on Aug. 26 at Ryle. This marked the second tournament win of the season for NewCath. The Lady Breds won the Ashland Invitational Tournament a few weeks ago. Defense has been a long-time priority for NewCath. The Lady Breds outscored the three opponents, 17-2. NewCath ran a 4-4-2 (defender-midfielder-forward) set with a 4-5-1 look at one point. Owensboro Catholic (13-2-2) ran a 4-3-3. NewCath freshman forward Taylor Tolle earned Most Valuable Player honors with a sensational tournament. Tolle scored six goals in the tournament with at least one per game. Tolle’s goal against Owensboro Catholic came in the second half to make the final score. Tolle had a hat trick against Bethlehem with three goals. Tolle and Chandler Cain led NewCath with two scores each against Pikeville. Junior Loren Zimmerman scored one goal per game for a total of three goals. Her marker in the first half gave NewCath the only goal it needed in the championship game. Ruthie Barth, Sam Bunzel, Ansley Davenport and Meg Martin joined Tolle on the All-Tournament team. Bunzel surpassed 2007 NewCath graduate Stephanie Burns and 2009 graduate Andrea Macke for the most assists in school history with her 25th against Bethlehem. Goalkeeper Martin recorded two saves against the Lady Aces. The game marked the third time NewCath and Owensboro Catholic met for a championship since 2010. The Thoroughbreds beat the Aces, 42-0 in the Class 2A state football championship in 2010 and the Lady Aces beat the Thoroughbreds in the All “A” basketball championship in Frankfort, 52-42 this past winter. Zimmerman, Davenport, Mikayla Seibert and Michela Ware played on that basketball team. Owensboro Catholic landed three players on the all-tournament team. They were Sara Haleman, Brooke Logsdon and Anna Belle Moore. NewCath gets back to work today. The Lady Breds travel across I-471 to face the 36th District rival Highlands Bluebirds. They then battle the defending 9th Region champion and state runner-up Notre Dame Pandas on Thursday in Park Hills. That game starts at 5:15 p.m. The Highlands Bluebirds volleyball team finished 1-4 in the Jefferson County Invitational Tournament at the Ohio Valley Volleyball Center on Friday and Saturday. Male defeated Highlands, 2-0 (25-12, 25-16) and Lexington Catholic beat Highlands, 2-1 (21-25, 25-14, 25-19) on Friday. Then on Saturday, Louisville Fern Creek beat Highlands, 2-1 (22-25, 25-23, 25-22). Highlands is 8-18 on the season. The Bluebirds return to action Tuesday. They play host to Dixie Heights at 7:30 p.m.
PARK HILLS – They picked an excellent Saturday afternoon to turn in their most complete football game of the year. The Highlands Bluebirds came out determined from the opening kickoff and dominated the host Covington Catholic Colonels, 42-6 to stay undefeated and earn the valuable leg up in the Class 4A, District 7 race. Highlands (6-0) also avoided a potential second-round road trip to eastern Kentucky and could be playing at home in the first three rounds of the playoffs. G. Michael Graham Photo. Highlands defensive back Jackson Bardo (3) tackles Covington Catholic wide receiver Logan McDowell (18) in the first quarter. Highlands beat Covington Catholic, 42-6 to extend its winning streak to 10 games over its big rivals. PARK HILLS – Head Football Coach Dale Mueller and staff do not buy into the argument that the annual Highlands Bluebird-Covington Catholic Colonel game is not a rivalry anymore. This comes even after Highlands dominated Saturday’s game, 42-6 to stay undefeated. The 6-0 Bluebirds have won 10 straight against Covington Catholic improving to 93-3 since the start of 2007. The Colonels (3-2) are the team Highlands has beaten the most during this run. NEWPORT – That familiar, good feeling of the thrill of victory found its way back to the Hill on Friday. The Newport Central Catholic Thoroughbreds played tough defense the entire game before their offense finished off drives in the second half to beat the visiting Lloyd Memorial Juggernauts, 22-7 in the Class 2A, District 6 opener for both teams. The victory snapped a four-game losing streak for the defending 2A state champions. The Thoroughbreds have won 16 in a row over the Juggernauts dating back to 1991 and lead the all-time series, 31-6. G. Michael Graham Photo. Highlands defenders Joey Cochran (24) and Bo Hebel (55) converge on Paducah Tilghman running back D.J. Sherrill (25) in Saturday's game in Paducah. The Bluebirds travel to Park Hills on Saturday to face the Covington Catholic Colonels at 1 p.m. It was a nice, clear summer day in early August. The Highlands Bluebirds senior captains led warm-ups before a practice. During that time, they shouted the familiar “Beat Colonels” phrase. That’s how much that annual game against Class 4A, District 7 arch-rival Covington Catholic means to the Bluebirds. Highlands faces its longtime rival Saturday in Park Hills at 1 p.m. The two Northern Kentucky powers have battled for state championships since the 1980s. Highlands is tied with Louisville Trinity for the most state championships with 22 and CovCath owns six. Highlands has won nine in a row in the series dating back to 2006 during their run of a state-record six consecutive state championships and 92-3 mark since the start of 2007. The Colonels are the last team to beat Highlands in the playoffs on their way to their last state championship in 2006. Highlands is 43-17 in the all-time series against Covington Catholic. That includes wins in both the regular season and playoffs in its title runs in 2007, 2011 and last year. Last year, Highlands beat CovCath twice in Fort Thomas – 35-21 in the regular-season and 28-13 in the regional championship. Highlands comes into the game undefeated at 5-0 while the Colonels are 3-1. They had a bye week last week after beating Henderson County, 18-0. CovCath’s lone loss came to Cincinnati Moeller, 45-7 on Sept. 7. Moeller won Ohio’s largest Division I state championship last year and is the alma mater of CovCath Head Coach Dave Wirth. The Colonels have endured their fair share of injuries. Senior running back Luke Bir is out for the season with junior quarterback Adam Wagner and senior linebacker Sam Burchell also missing games because of injuries. Burchell has yet to play. The Colonel defense has still been strong as they have outscored the opposition, 94-58. The Colonels shut out Boone County and Henderson County. Senior defensive backs Adam Fischer and Matthew Way lead the Colonels with 27 tackles. Way also has five interceptions. CovCath may return several three-year starters and a four-year one. But the Highlands spread attack makes teams defend the entire field. Highlands has outscored the opposition, 234-120 and outgained opponents, 2,147-1,761 in total offense. Senior quarterback Drew Houliston continues to put up impressive numbers for the Bluebirds. Houliston has completed 90-of-131 passes for 1,547 yards, 21 touchdowns and just one interception. The Bluebird offensive line has blocked well for most of the year. Houliston was sacked six times in the recent road win at Paducah Tilghman. But the Bluebirds did not allow any in the second half making adjustments to Tilghman’s delayed blitzes. Highlands has seen 12 different wide receivers catch passes. Junior Jensen Feggins leads the way with 20 catches for 299 yards and five touchdowns. Senior Brandon Hergott is third on the team with 10 receptions for 156 yards and five touchdowns. The Bluebirds rested senior running back Zach Harris against Tilghman. But he has 362 yards rushing on 47 attempts with eight touchdowns and 14 receptions for 233 yards and five touchdowns. Highlands showed its depth in that game at Tilghman. Fellow senior running back Jaylen Hayes rushed for 154 yards on 20 carries and two touchdowns. His season total is 232 yards rushing on 37 carries and three scores. Highlands may have the mental advantage coming into the game. But Wirth never seems concerned about that. The injuries have forced the Colonels to play at lot of sophomores, especially at the skill position spots in their Spread offense. Sophomore Ben Dressman has stepped in for Adam Wagner and with classmates Ben Darlington and Ryan McGinness stepping forward at running back and wide receiver respectively. Ben Dressman has completed 21-of-34 passes for 268 yards and two touchdowns. Senior Sam Dressman leads the Colonel rushing attack with 197 yards on 28 carries and two touchdowns and senior Sam Hatter leads CovCath with eight catches for 120 yards and two touchdowns. The Highlands defense has bent a couple times this year, but has come through in many clutch situations. Urlange and Rocco Pangallo lead the Bluebirds with one interception each. Seth Hope leads Highlands with four tackles for a loss with Thomas Wrobleski making 3.5 and Brady Murray and Joey Cochran recording three each. Braden Hicks, Bo Hebel and Hope have on sack each. CovCath will become the fourth most common school opponent in school history after this game. The Bluebirds entered the season having played CovCath and Dayton 60 times in school history. They’ve only faced Covington Holmes (71), Dixie Heights (70) and Newport (66) more than CovCath and Dayton. The Highlands Bluebirds boys soccer team downed the host Covington Holy Cross Indians, 3-0 on Thursday. Chris Garbig scored twice for the Bluebirds (9-5-1) and Colin Dean scored the other one. Nathan Tippenhauer recorded five saves for Highlands with Nick Brelin making the other. Highlands plays again Tuesday. The Bluebirds face Conner at 7:30 p.m. at Tower Park. The Thoroughbreds improved to 9-3-1 with the win in Cythiana. Matt Tolle scored the goal for NewCath with Ben Tierney making the assist. Paul Grosser recorded six saves at goalkeeper for the Thoroughbreds. NewCath plays again Tuesday. The Thoroughbreds play host to Covington Holy Cross at 7 p.m. The Thoroughbreds improved to 11-12 with a 25-4, 25-14, 25-7 win in Covington. Rachel McDonald led NewCath with seven kills and Keyaira Lankheit followed with five. McDonald added 11 aces and Alyssa Maier had 15 assists. NewCath does not play again until Thursday. Cooper comes to the Hill for a 7:30 p.m. contest. The Highlands Bluebirds boys and girls cross country teams have continued to do well in recent meets. The girls are still the top-ranked team in Class AA followed by North Oldham, Louisville Christian Academy, Scott and Lexington Catholic. Molly Mearns is still the top-ranked runner in the class. The boys dropped two second in Class AA following the recent Trinity Invitational. North Oldham is the top-ranked team with Covington Catholic, Wayne County and Russell following the Bluebirds. Ethan Shuley is the second-ranked runner in Kentucky. Both teams recently partook in the Trinity/Valkyrie Invitational. The girls finished 15th out of 43 teams without Paige Dauer and Francis Tracy. They were taking the ACT exam. A total of 347 girls ran in the race. Mearns led Highlands (57th in 19 minutes, 41 seconds). Teammates Chloe Gastright (67th in 19:55), Sydney Ossege (85 in 20:17), Lauren Ossege (108 in 20:38) and Brianna Collins (234 in 22:37) followed Mearns. The boys finished 19th out of 53 teams. Shuley led the way for Highlands finishing 47th in 16:05 out of 473 runners. John Michael Griffith followed at 92nd in 16:37. The other Highlands scorers were Geoff Mearns at 170th in 17:10, Matt Gray (182 in 17:23) and James Smith (220 in 17:42). Jackson Paul (221 in 17:43) and Will Backscheider (297 in 18:19) rounded out the Highlands runners. The Bluebirds also won the Campbell County Championships beating Bishop Brossart. Mearns won the race on the girls side in 19:29 with Gastright taking second in 19:47, Sydney Ossege fourth in 20:27, Lauren Ossege fifth in 20:36, Dauger sixth in 20:48, Tracy eighth in 21:38 and Collins ninth in 21:49 out of 30 girls. There were 43 boys in the race. Griffith finished second in 16:17 followed by Shuley (third in 16:30, Gray (sixth in 17:34), Smith (ninth in 17:47), Paul (12th in 18:01) and Backscheider (17th in 18:23). Highlands faces more stiff competition in the Cincinnati St. Xavier Invitational on Saturday. The Bluebirds also participate in the Williamstown Invitational on Oct. 5 and the Northern Kentucky Athletic Conference Meet on Oct. 8. The Lady Breds (8-1-2) tied the Lady Colonels on Wednesday in Crestview Hills. Both goals came on penalty kicks. Allie Otten scored the lone goal for NewCath. Dixie Heights got off four shots. NewCath freshman goalkeeper Meg Martin made three saves. The Lady Breds travel to the All “A” State Tournament on Saturday at the Elizabethtown Sports Park. They take on Pikeville at 9 a.m. on Field 11. Contributed Photo. Army senior soccer player Jason Lewis (12), a 2010 Highlands graduate), kicks the ball ahead in a recent game. Lewis is a team captain for the Black Knights this year. Army is 5-1-1 this year with six shutouts. Jason Lewis headed to West Point (New York) to focus on academics. The 2010 Highlands graduate was not recruited by anyone despite helping the Bluebirds to a state runner-up finish as a junior in 2008. But he ended up playing club soccer and the itch came back. Lewis ended up trying out for the Army Black Knights NCAA Division I soccer team and earned a spot on the team in April of his freshman year of 2011. The 6-foot-1-inch, 175-pound midfielder has helped turn around the Black Knights. They are 5-1-1 this year after going 7-10-1 Lewis’ sophomore year and 4-10-3 his junior year. Head Coach Russell Payne is in his fourth year as the Army Head Coach. Lewis played just one game as a sophomore before playing 12 more as a junior. Lewis scored his first career goal at Bucknell last year. That ended up being the game-winner in Army’s 2-1 win. He played center back last year and is a team captain. Through seven games, the 21-year-old has one goal on two shots on goal. That score came in Army’s 2-0 home win over Manhattan on Sept. 2. The Black Knights started the year 5-0 outscoring the opposition by a combined, 9-0. They tied Quinnipiac, 0-0 before losing 3-2 to Houlston Baptist University in their two most recent games. Lewis said the team’s main focus the rest of the year is working on its possession game. Lewis said the start was big because Army had nine games where it did not score last year. That included four in a row at one point. The Black Knights hope to win the Patriot League this year. They’re still guaranteed an automatic berth to the NCAA Tournament despite that. The Patriot League comprises of a six-team playoff. "Having coached Jason when he played for Highlands, I am not surprised at all that he is having this much success at the next level," said Matt Ewald, former Highlands assistant. "Jason leads by example and he was always working to push his teammates to succeed. His knowledge of the game was beyond his years as a young player and he worked tirelessly to improve his fitness. Most of all, it is awesome to see such a great kid, one that went through the soccer program at Highlands, doing amazing things as an army cadet. Congrats, Jason." Lewis said every student-athlete has its schooling paid for. But it took him some time to adjust to life in West Point. Lewis is double majoring in German and International Relations. He currently owns a 3.1 grade-point average on a four-point scale. Lewis is part of the Field Artillery Branch. He said you have an eight-year commitment and you can stay in the army or move on after that point. That commitment includes the possibility of going to war. Lewis may have been gone for four years. But he still keeps an eye on things back in Fort Thomas. The Black Knights have 11 games left this season. Five take place in West Point. G. Michael Graham Photo. Newport Central Catholic running back Jacob Smith (with ball) heads toward the end zone in Friday's game at Dixie Heights. The Thoroughbreds open Class 2A, District 6 action against Lloyd Memorial at 7 p.m. Friday. The scene looks somewhat familiar for a good reason. It was about a year ago on Oct. 6, 2012. The Lloyd Memorial Juggernauts came to Newport with a nice 6-1 record while the Newport Central Catholic Thoroughbreds stood 2-4. But the Thoroughbreds ran away with a 63-22 Class 2A, District 6 victory on their way to another district championship, an 11-4 record and ultimately a nine-game winning streak that led to their fifth state championship. NewCath holds a perfect 20-0 mark in regular season play against district competition since football in Kentucky expanded from four to six classes in 2007. The Thoroughbreds have won 23 straight regular season contests against district competition. The Thoroughbreds (1-4) are hoping for more of that in addition to getting back to their winning ways. They play host to a 3-2 Juggernaut squad that has improved in recent years. Game time is 7 p.m. in Newport. Injuries mostly on the offensive and defensive lines have hurt the Thoroughbreds big-time in their four-game losing streak. Opponents have dominated the line of scrimmage during that time. But NewCath hopes to have players like Stephen Brooks, Logan Neff, Jacob Wieland and Matt Lenz back back Friday. But NewCath Head Coach Wagner said those decisions will be made around Thursday when they see the doctors. Lloyd Memorial comes into the game on a two-game winning streak. The Juggernauts own road wins out of Class 2A, District 5 opponents Owen County (34-7) and Gallatin County (28-0). The Juggernauts have a new head coach in former Boone County Offensive Coordinator Eric Turner. Last year’s head coach Josh Stratton took a job at New Richmond (Ohio). Lloyd Memorial has upgraded its schedule this year facing three 4A opponents after facing no one higher than Class 3A last year. Two of those 4A opponents have handed them two losses in Marion County (26-18) and Covington Holmes (34-28). The Juggernauts play Pendleton County later in the year. Like last year, the four losses came to bigger schools for NewCath. The Thoroughbreds have been outscored 144-93 and outgained 1,905-1,013 in total offense. The Thoroughbreds will run their Spread offense against a 3-5 Juggernaut defense. Senior quarterback Mac Franzen has completed 39-of-75 passes for 543 yards, five touchdowns and seven interceptions. His top target has been 6-foot-5-inch wide receiver Tommy Donnelly with 10 catches for 235 yards and a touchdown. Franzen and sophomore Jacob Smith lead the NewCath rushing attack. Last year’s top running back Dylan Hayes did a wonderful job following the NewCath linemen. Smith and the other NC runners hope to do a lot more of that this year. The Juggernauts will throw a mixture of formations at the Thoroughbreds. They ran a spread offense out of the shotgun last year. Senior Brian Warren had led the Juggernaut rushing attack before going out for the season with an injury at Owen County. Turner said the Juggernauts lost a couple other key players to injuries at Owen County. But he likes how senior Jared Gabbard and junior Hayden Molitor have picked up their games. Both are listed as quarterbacks offensively and play in the secondary on defense. NewCath will throw out its vaunted 4-4 defense. Senior linebackers Jack Sutkamp and Kalvin Moore led the Thoroughbreds there. They also help earn some big yardage on the ground. NewCath leads the all-time series against Lloyd Memorial, 30-6. The Thoroughbreds have won 15 in a row over the Juggernauts dating back to a 31-29 loss on the last game of the 1991 regular season. The host Cincinnati Anderson Redskins edged the Highlands Bluebirds boys soccer team, 2-1 Tuesday just across the Ohio River. Chris Garbig scored the lone goal for the Bluebirds (8-5-1). Highlands goalkeeper Nathan Tippenhauer recorded five saves. Highlands plays again Thursday at 5 p.m. The Bluebirds battle the Covington Holy Cross Indians at Farris Park. The Thoroughbreds (10-12) equaled last year’s win total with a sound 25-19, 25-19, 25-18 win in Alexandria Tuesday. Keyaira Lankheit led NewCath with nine kills and five blocks and Nikki Kiernan had seven kills and three blocks. Setter Alyssa Maier added 22 assists and four aces. NewCath travels to Covington Holmes on Thursday. Game time is 7 p.m. The Bluebirds (7-14) again lost to the Lady Cougars in three sets. Highlands plays in the Jefferson County Invitational starting Friday. The Bluebirds take on Louisville Male at 7:30 p.m. and Lexington Catholic at 8:30 p.m. The Highlands Bluebirds boys soccer team (8-4-1) downed visiting Louisville St. Francis, 4-1 on Saturday at Tower Park. Mitch Gesenhues, Chris Garbig, Colin Dean and Cole Davis-Roberts scored the goals for Highlands. Goalkeeper Nathan Tippenhauer had no saves. Highlands plays at Cincinnati Anderson on Tuesday. Game time is 7 p.m. The Bluebirds (4-5-1) lost in the title game of the prestigious Lexington Catholic Cup on Saturday. But Highlands has come a long way. The Bluebirds didn’t win any games in this tournament last year and already have one more win than a year ago. Sarah Owen made the all-tournament team making six saves. Teammates Allyson Bridewell and Taylor Vaughn also made the all-tournament team. Highlands does not play again until Sept. 30. The Bluebirds take on Newport Central Catholic at 7:30 p.m. The Bluebirds are 7-13 going 1-3 on the second day of the Cake Classic. They finished 2-3 in the tournament after not winning any games in it last year. Highlands beat Dixie Heights, 2-0 (25-23, 25-13). But the Bluebirds lost to Woodford County, 2-0 (25-16, 25-20); Madison Central, 2-1 (15-25, 25-23, 15-10; and Bishop Brossart, 2-0 (25-18, 25-23). Highlands plays host to Conner in a tri-match on Tuesday. Newport Central Catholic is 9-12 after winning one of four games in the Mother of Mercy Tournament on Saturday and Sunday in Cincinnati. NewCath lost to Dublin (Ohio) Coffman, 2-0 (25-20, 25-20) and Toledo (Ohio) Central Catholic, 2-0 (25-14, 26-24) on Saturday. The Thoroughbreds then beat Covington Holy Cross, 2-0 (26-24, 25-23) before losing to St. Francis DeSales (Ohio), 2-0 (25-9, 25-22). The Thoroughbreds travel to Bishop Brossart on Tuesday. Game time is 7:30 p.m.
PADUCAH – It does not matter if their schedule takes them to the Jackson Purchase or the deep, dark hills of eastern Kentucky. 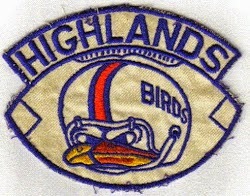 Few teams in the country, let alone the Bluegrass State, win as consistently as the Highlands Bluebirds football team. The Bluebirds may not have dominated like usual. But they did put away the pesky host Paducah Tilghman Blue Tornado in the fourth quarter, 42-25 on Saturday. Highlands stayed undefeated at 5-0 and improved to 92-3 since 2007 with the win and 847-225-26 in school history since the program began back in 1915. On the other side, the Blue Tornado (1-4) dropped their fourth in a row since opening the year with a 24-23 win on Aug. 24 at newly-formed county rival McCracken County. Highlands played its second of three consecutive Saturday games. But the Bluebirds did not secure the game at John Hardin a week ago until senior Zach Harris recovered an onside kick with 43 seconds left. Highlands elected to rest Harris. But the Bluebirds once again put up huge offensive numbers outgaining the Blue Tornado, 375-314. Highlands had 17 first downs to 10 for Tilghman. But fellow senior Jaylen Hayes picked up the slack for Highlands rushing the ball 20 times for 154 yards and two touchdowns. Hayes scored once on a shotgun zone read play and the second one taking a direct snap in the Highlands full-house backfield. Highlands senior quarterback Drew Houliston once again came through completing 16-of-26 passes for 266 yards and three touchdowns. Junior Jensen Feggins led the Bluebirds with six catches for 108 yards and two touchdowns. The Bluebirds had to make some adjustments against the Tilghman defense. The Blue Tornado recorded six sacks in the game. Houliston had been sacked just three times all season entering the contest. Tre Coleman led the Blue Tornado with 113 yards on 10 carries. He broke free for an 80-yard touchdown in the second quarter. But the Bluebirds made some adjustments on him after that. Tilghman threw a lot of short passes with sophomore quarterback Jesse Dunigan. He completed 20-of-27 passes for 136 yards. Senior Mikey Davis led the Blue Tornado with seven catches for 56 yards. Both teams lost one fumble. Jackson Bardo recovered a Tilghman fumble in the fourth quarter and Highlands lost one in the first quarter. The Bluebirds did not score in the first quarter for the third time this season. They trailed 6-0 after the first quarter after two Logan Besaw field goals from 26 and 42 yards out. Highlands took the lead for good at 7-6 when Houliston scored around the left side from six yards out and Jared Dougherty made his first of six extra-point attempts. Highlands wide receiver Ryan Greene returned a kickoff back to the Highlands 49 to start the drive. The Bluebirds drove deep into Blue Tornado territory on their next possession. But the Blue Tornado blocked the field-goal attempt. But Highlands scored on its next possession. Houliston rolled left and found Feggins open for an 8-yard score. The Bluebirds then responded to Coleman’s quick score. On 4th-and-5 from the Tilghman 7 with 53 seconds left in the half, Houliston found Jake Whitford in the back of the end zone for the touchdown. The Bluebirds led 21-12 at halftime. Tilghman ate up a lot of the clock on a long drive to start the third quarter. Instead of throwing the short sideline routes, they threw 10-15 yards down the field to keep the Bluebird defense guessing. Dunigan scored on a 1-yard run to cut the margin to 21-19 with just more than three minutes left in the third. The Bluebirds then scored with about 10 minutes left in the fourth quarter. Hayes scored from eight yards out after Houliston completed a 26-yard pass to Alex Veneman. But the Blue Tornado marched back down the field. Out of the Power-I formation, Dunigan faked a handoff then found Jordan Tyler for a 22-yard touchdown reception. The two-point pass failed as Highlands still led 28-25. The Bluebirds then put the game away with two touchdowns. Houliston found Feggins for a 9-yard score. That came after Tilghman sacked Houliston on third down, but the Blue Tornado committed a defensive holding penalty giving the Bluebirds another chance. Hayes then scored his second touchdown on a 41-yard scamper. Highlands concludes its three-game Saturday road swing this week at Covington Catholic (3-1). Game time is 1 p.m. in Park Hills. G. Michael Graham photo. Highlands junior defensive back Kyle Martin (left) takes down Paducah Tilghman's Mikey Davis in Saturday's game. Highlands won 42-25. It takes about five and a half hours to get from Fort Thomas to Paducah. But the Highlands Bluebirds football team made sure they used their time on the bus really well. Road trips often build team chemistry. That proved to be the case in Saturday’s 42-25 win over the Blue Tornado. Highlands improved to 92-3 since the start of 2007 with the win. Some teams struggle on the road for various reasons such as not playing in front of friends and family. The Highlands student section is known as the OZone. But the Bluebirds bring their own intensity no matter where they play. This will mark the longest trip of the regular season. The final road games are Saturday at Covington Catholic at 1 p.m. and Oct. 25 at Cincinnati Elder. Game time is 7:30 p.m.
Highlands and Paducah Tilghman met five times between 1989 and 1994. But none of the games took place in either Fort Thomas or Paducah. Highlands extended its series lead to 5-1 all-time against the Blue Tornado. Highlands beat Tilghman for the Class 3A state championships in 1989 (27-3) and 1992 (15-6). Highlands does not travel to western Kentucky much. But the Bluebirds had success on their last trip there in 2008. They beat Hopkinsville, 48-21 in October of that year. If Highlands wins another district championship, it will not have to hit the road until the state semifinals. It takes about 3.5 hours to make it to Bowling Green for the state championships. Class 4A plays on Saturday, November 30 this year unlike the Friday night game last year. The Highlands supporters continued to travel well as many made the trip west. The cheerleaders also came on the trip. They had some previous adventures on road trips. They came to Louisville Western last year on a bus without air conditioning. The cheerleaders play a big role in helping the team build some intensity. They also traveled to John Hardin last week. The Highlands band and dance team generally do not go to road games. The road trip consisted of coming down Interstate 71 to Louisville then taking I-65 to exit 91 to the Western Kentucky Parkway. The Western Kentucky Parkway ended at Interstate-24. Highlands then took it west to Paducah. The trip did not come without issues. Three buses came to the game and one malfunctioned so the team traveled back on two buses. Tilghman is the lone team the Bluebirds have faced from the Jackson Purchase. The Jackson Purchase part of Kentucky borders Tennessee and is surrounded by the Ohio River to the north, the Mississippi River to the west and the Tennessee River to the east. It is comprised of Fulton, Hickman, McCracken, Ballard, Carlisle, Graves, Calloway and Marshall Counties. The main power in western Kentucky is 1A power and Tilghman rival Mayfield. The Cardinals and Bluebirds entered the season as one of just six programs in the country with 805 or more wins in school history. But the two have never met on the gridiron. Highlands ranks first in Kentucky with 847 wins in school history only behind 880 wins by Valdosta (Ga.). Mayfield ranks third in Kentucky with 810 wins and Louisville Male is second with 825. All three teams are a combined 14-0. Highlands can now focus on the team that is constantly a threat to its dominance. The undefeated Bluebirds travel to Park Hills for the annual district showdown with 3-1 Covington Catholic. The Twitter accounts exploded on both sides of the week leading up to the game last year. But Mueller wants the players to be smart when posting things on the Internet. "I don't get involved in all the online stuff, but (being smart about posting on the Internet) is a good reminder," Mueller said. "It really isn't personal. The CovCath players are great guys. We just try to beat them in a football game." CovCath had its bye week this week. The Colonels beat Boone County and Dixie Heights to open the season before losing 45-7 to defending Ohio largest-class Division I champion Cincinnati Moeller. Moeller is the alma mater of Colonel Head Coach Dave Wirth. CovCath also played in western Kentucky on Sept. 13. The Colonels knocked off Henderson County, 18-0. Highlands leads the all-time series with Covington Catholic, 43-17. This includes nine straight wins dating back to 2006 during its run of six straight state championships. Covington Holmes also had the weekend off. The Bulldogs are 3-1 under first-year head coach Ben Nevels. But Harrison County did play Friday. The Thoroghbreds (2-3) lost 64-21 at Bourbon County. Class 3A Bourbon County was undefeated last year before losing 35-10 at Belfry in the state semifinals. Highlands is one of just three teams in Class 4A that are still undefeated. The other two are familiar opponents. The Boyle County Rebels are 5-0 and the Johnson Central Golden Eagles 4-0. Boyle County beat George Rogers Clark, 34-17 on Friday. The Rebels recently escaped a close call, 30-27 against Anderson County on Sept. 13. Johnson Central opened the season against two non-Kentucky opponents. The Golden Eagles demolished Holy Trinity (67-7) of the Canadian province of Ontario and Noblesville (Ind. ), 72-28. Noblesville is located just north of Indianapolis. The Golden Eagles then beat Perry County Central (53-7) and Harlan County (36-14). They have not left Paintsville and won’t until an Oct. 4 trip to Ironton (Ohio). Both teams could finish the season undefeated. Boyle County’s biggest test left is Oct. 4 at home against Lexington Catholic (3-2). The Knights’ two losses came to Bowling Green (48-21) and Louisville St. Xavier (49-28). The Golden Eagles often battle Ashland Blazer for the District 8 championship. The two meet Oct. 25. Johnson Central then meets Belfry on Nov. 1 to end the season.